I’ve been building up a collection of border files for us to use in Google Fusion table maps – and these are the key ones. You can download these as KML files or as CSVs. Or merge them with your data. If you have a shp file you what to convert to Google Fusion tables try shpescape, which will do it for you. And there’s a new site too which looks promising: Inquiron, which converts geofiles into a variety of formats. Google’s Public Data explorer is a good place to find others too. I would love this to become more comprehensive – do you have any borders you can share? Hi there. Do you know where I can find an accurate UK Postcode boundary fusion table? I found one, but when mapped against the LSOA boundaries, they don’t seem to correlate. This looks like just what I’ve been searching for, but I can’t seem to download the LSOA data as a KML file. Is this right? Appreciate this comment is maybe three years too late (just proves the continuing relevance of your work! ), but I’m looking to map Local Authorities in the UK and the link above says not to use your data. Any idea where to look for the most recent data + KML boundaires? Actually, I think it is still current. Does it not look like it? A very useful collection of links. My only problem is that the Local Authorities set (#3 on your UK list above) seems to be locked down now. I can neither merge from it, since Fusion doesn’t allow me to choose a field to match with my table, and nor can I download the data to clean it up a bit and get around the merge problem that way. All Google searches seem to return to your site! This data must exist somewhere. Any thoughts? Is the LSOA dataset based on the one from the ONS data portal? Lower layer super output areas (E+W) 2011 Boundaries (Full, Clipped) V2? Thanks for your help with these – really useful! Hi Simon. Great site. Do you know if the video course will be available again soon? Its currently closed. Thanks, Chris. Hi Simon, I used your England LSOA data to map areas which qualify for funding assistance under ECO (I was looking especially at the rural element which is very scattered) and it has proven to be very helpful, I would like to do a similar thing with Scotland but I cannot seem to locate that data anywhere. Would you have any ideas where I may locate it? Thanks for the useful resource links, made my work a lot easier as I am a complete newbie to fusion tables, great tools though! Hi Simon. Thanks for these files they have been massively useful. One thing I can’t seem to find is the boundaries for UK Parliamentary constituencies, do you have any idea where may have them? Hi there – these are the 2013 boundaries. Thanks Simon, looks like exactly what I need. 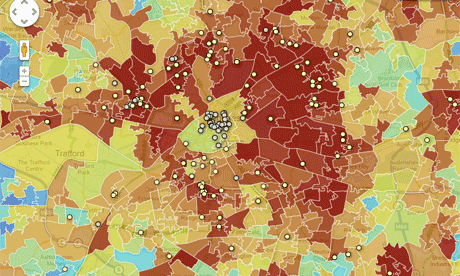 This is great, trying to map recent fuel poverty stats. Thanks!! ONS’s new Open Geography Portal is a very useful source of UK boundary files. I’ve just blogged about this at http://ukdataexplorer.blogspot.co.uk/. It’s actually the data here (http://www.education.gov.uk/researchandstatistics/datasets/a00196810/schools-pupils-and-their-characteristics-january-2) on Free School meals that I am trying to map (which I have seen on the Guardian already….). I tried using both the id codes and the names but it didn’t work. I went through the tutorial on your blog and that worked fine so not sure what I am doing wrong. Will keep trying! but the coverage is very patchy – maybe only 15 % of LAs are being picked up. Any suggestions or alternative tables? FYI I tried to access your US counties file but got a permissions error. Hi – my bad. Just sorted the permissions and should be fine now.